Superheroes aren't just one genre. They're tons of genres, smushed together. Aliens rub elbows with supernatural beings. Gods walk side by side with monsters. Over the decades, superheroes have borrowed from other genres, sometimes swallowing them whole. Here are 10 genres that got absorbed into superheroes, partly or completely. Some of these genres no longer exist as separate entities, while others still carry on, even though they've been partly absorbed into the superhero machine. Back in day, pulp characters like the Shadow, the Whisperer, the Spider and the Masked Detective fought crime anonymously in the big, dirty city. Those characters are gone, but they live on in Batman, the Arrow TV show, the Spirit, and tons of other masked or secret crime-fighters. Sometimes dreadful supernatural forces invade our reality, and push their way into our dimension so they can wreak unspeakable damage upon us. Mad gods and ancient monstrosities, they're a staple of Lovecraft-era Weird Tales, and in the pulps they're encountered by heroes such as Silver John. And nowadays, they're the sort of thing encountered fairly often by Dr. Strange, John Constantine and the members of Justice League Dark, among many others. In the tradition of Frankenstein and Jekyll and Hyde, there have been tons of novels and movies about people who become monsters, or monsters who are almost people. Often, they hide from a society that fears and misunderstands them. Transplanted into the superhero genre, characters ranging from the Incredible Hulk to Hellboy to Swamp Thing get to tangle with big robots and alien invaders, as well as fellow monsters. Image via Doctor Caracter. There were so many jungle adventure pulps and comics in the early part of the 20th century, until they finally got pulled into the superhero world. Besides Tarzan, there were Ki-Gor the Jungle Lord, Tam, Son of the Tiger, Morgo the Mighty, Kaanga, Yarmak the Jungle King, Blanda Queen of the Jungle, and countless others. One character, Ka-Zar, started out as a pulp adventure hero, only to be reinvented a couple of times and wind up as a Marvel Comics character. Other jungle superheroes include Black Panther, B'wana Beast, Congorilla and the Phantom. Oh, and let's not forget Lo-Zar. 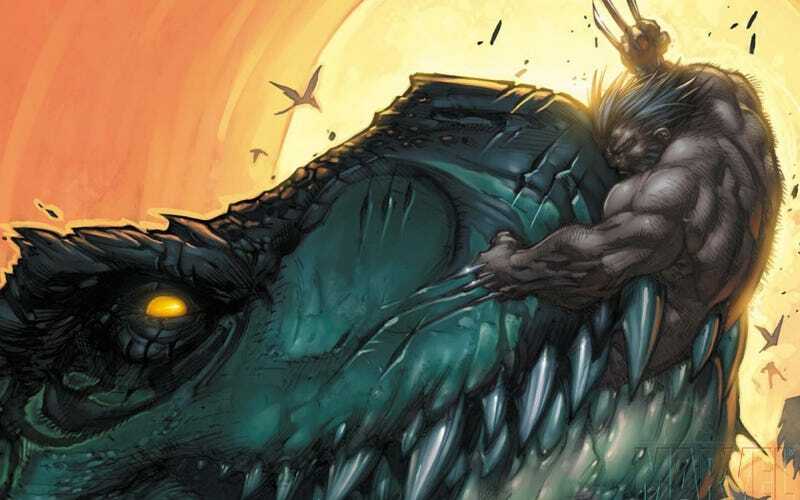 As a side note, the Land of the Lost trope of a secluded region where dinosaurs and other extinct predators still roam reaches its perfect expression in things like Marvel's SavageLand. Back in the day, there were tons of adventurers toting rayguns into space, including Flash Gordon, Perry Rhodan, Buck Rogers, Rocky Jones Space Ranger, Captain Video, Captain Future and countless others. They had pulp stories, film serials, radio serials and television shows — including a few comebacks in the past few decades, including a Flash Gordon movie and a Buck Rogers TV show. But these days, arguably the most famous pulpy space adventurers include Adam Strange, Captain Mar-Vell, the Guardians of the Galaxy, and to some extent Green Lantern and Nova. Classic novels from Starship Troopers to John Steakley's Armor to Joe Haldeman's Forever War have explored the notion of a human wearing armor that gives him or her superhuman strength. This is also a staple of Japanese animation, manga and live-action cinema. And these power-suit-wearing characters often slide into becoming cyborgs. Nowadays, the most famous power armor-wearing and cybernetic characters include Iron Man, Steel and Cyborg. At the height of the kung-fu movie boom in the United States, martial arts heroes invaded comics, from Shang-Chi Master of Kung-Fu to Richard Dragon to Iron Fist to Karate Kid to Bronze Tiger. Often, these characters will have origins — and ongoing storylines — that are largely lifted from martial arts movies in their own comics, but they're also perfectly capable of fitting into a larger superhero universe. From the beginning of the epic fantasy genre, authors retold and repurposed classic Greco/Roman and Norse myths, among others — and starting with Wonder Woman and continuing with Marvel's Thor and Hercules, superhero comics borrowed liberally from classical mythology as well. Both Marvel and DC have their own versions of Atlantis and their own Greek gods, and by now almost every great mythological figure has made at least a brief cameo in a superhero comic. You'd be hard pressed to find a fictional version of Thor or Hercules more famous than their comic-book incarnations, at this point. We still have stories about mad scientists — but usually these days, in most media, they do more harm than good. And, as TVTropes says, the mainstream idea of the "science hero" who goes exploring other realms or other universes is somewhat discredited "because post-modernism rejected progress for progress's sake." So we see fewer zippy science adventurers like Johnny Quest's family, or Bernard Quatermass or Buckaroo Banzai or the cast of Destination Moon these days. Luckily, though, we still have Reed Richards and the Fantastic Four going on crazy jaunts into the Negative Zone. Or Rip Hunter and Booster Gold exploring time travel and other universes. The science adventurer still exists outside superhero narratives, but he/she still has a healthy life inside them for sure.